Need a replacement for the white wine in a recipe? One of these nonalcoholic substitutes should work beautifully. 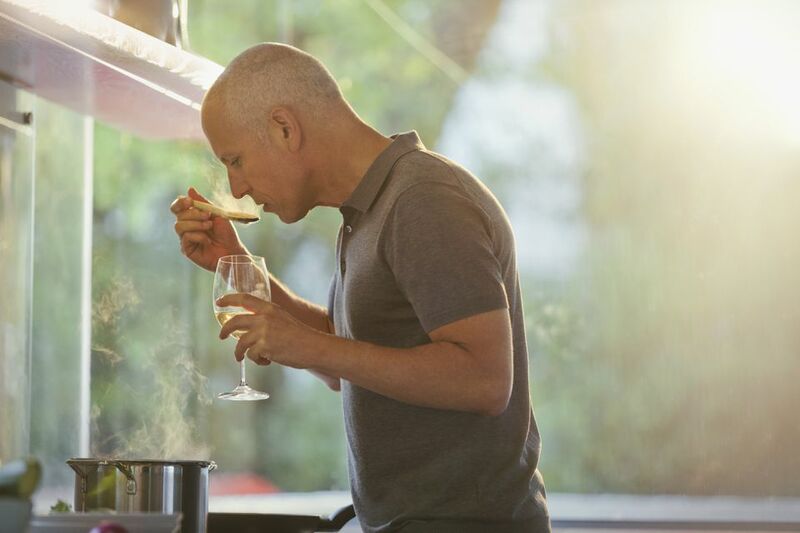 Chicken broth: Replace the white wine called for with an equal amount of chicken broth (vegetable broth will work, too). This will add depth to the recipe, even if it changes the flavor a bit. If you aren't using a low- or no-sodium broth, you may want to taste the dish you're making before you add any additional salt. Apple juice: Swap in apple juice for the white wine in your recipe. It'll add that bit of sweetness that the wine contributes. Since apple juice is sweeter than wine, consider adding a splash of vinegar or lemon juice to dial it back a bit. White grape juice: Keep that white grape flavor in your recipe by using white grape juice in place of the white wine. It'll be quite a bit sweeter than the wine, so you may need to add a bit of vinegar or lemon juice to balance the flavor. Apple cider vinegar: If you happen to have it on hand, apple cider vinegar is a great substitute for white wine. It's sweet like the wine and has a similarly aged depth. White wine vinegar: If your recipe calls for dry white wine, white wine vinegar is a solid alcohol-free option. Since it's made from white wine, it'll have some of the intended flavors. However, it will be more acidic, Dilute it with water to compensate for this. A mix of 50 percent vinegar and 50 percent water should do the trick. Apple cider vinegar: Use a 50-50 mix of apple cider vinegar and water in place of the white wine called for in your recipe. It'll add that fruity/acidic bite that the recipe needs. Ginger ale: Replace the white wine called for with an equal amount of ginger ale. It has that same sort of dry, sweet taste, so it'll work nicely. Water: If you don't have any of these other ingredients on hand, replace the wine called for with the same amount of water. It won't enhance the flavor of your recipe, but it will keep the liquid volumes as intended, ensuring that your dish doesn't turn out dry. If you are trying to eliminate all of the alcohol from your cooking, you have plenty of options. Learn how to use nonalcohol substitutes for red wine, beer, and various flavoring extracts. Indeed, there are a number of alcohol substitutes if you want to omit the hard stuff from your recipes. Even if you're not trying to substitute for alcohol—but want to keep your recipe on track without making a trip the store—discover cost-saving ingredient substitutions you can use in dozens of recipes. In addition to swap-outs for alcohol, you can use alternative ingredients for herbs and spices, baking ingredients, sugars and sweeteners, and much more.